Home Office Collection Overview – First exhibited at Home Works, Robin Guilds showroom in Pimlico London. The Home Office Collection comprised a comprehensive range of furniture including desks, shelves, tables, lamps, occasional tables, trestle tables, sideboards and glass-fronted cabinets. The glass-fronted cabinet was first designed by Johnny Grey and the table by Mark Lewis; each was first made and installed into the scheme for Lady Pamela Harlech’s kitchen in Notting Hill. It was this that set the tone for the range. Mark Lewis was then charged with the task of developing the range into its full complement of furniture and accessories. The era of Arts and crafts, Art Nouveau, Art Deco, and periods preceding these were an influence. These periods of our design history used to craft and decoration to enhance the design and construction of furniture and buildings. Here we combined the contemporary idioms of High Tech, Post Modernism, and Neo-Classicism each significant design movements of the eighties. However the most significant being Modernism had the support of the majority of Architects and Designers who had rejected decoration and followed, with religious ardor, the principals of form following function. This edict now prevalent in 20th-century design ensures that most everything is no more interesting than a well-proportioned cube. Consequently, these designs found little support from the establishment despite the abundant media coverage the range was given at the time. 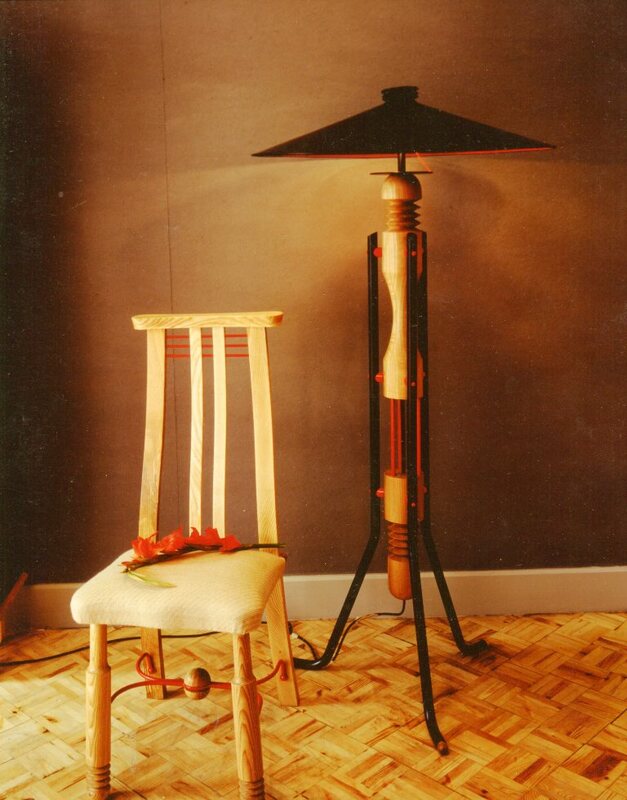 Project: Standard lamp and dining chair. Turned ash, spun steel shade, coated bent steel tube. Home Office collection Mark Lewis as an associate of Johnny Grey Design, 1980-83. Project: Occasional table turned ash, coated rolled tube, coated bent steel tube. Home Office collection Mark Lewis as an associate to Johnny Grey Design, 1980-83. Project: Dining table, turned ash, coated rolled tube, coated bent steel tube. Home Office collection Mark Lewis as an associate to Johnny Grey Design, 1980-83. Project: Credenza/sideboard with integrated fridge and side cupboards, black lacquer, acrylic door pull, an acid etched mirror to up standby Artist, Ilinca Cantacuzino, glazed doors with coated wire. Home Office collection Mark Lewis as an associate to Johnny Grey Design, 1980-83. Project: Production drawing, Single pedestal desk, solid lipped and veneered board, turned ash, coated steel tube, black lacquered board, red acrylic drawer pulls, and solid ash board forming the modesty panel arrangement. Home Office collection Mark Lewis as an associate to Johnny Grey Design 1980-83. Project: Production drawing, Adjustable shelf unit, black lacquered open structured end panels, turned ash, coated steel wire, solidly lipped and veneered board. Home Office collection Mark Lewis as an associate to Johnny Grey Design 1980-83. Project: Production drawing, Dining/conference table, solid ash panels forming tabletop, turned ash, coated rolled tube, coated bent steel tube. Home Office collection Mark Lewis as an associate to Johnny Grey Design 1980-83. Project: Production drawing, Computer table. Solid lipped and veneered board, turned ash, black lacquered panels. Home Office collection Mark Lewis as an associate to Johnny Grey Design 1980-83. 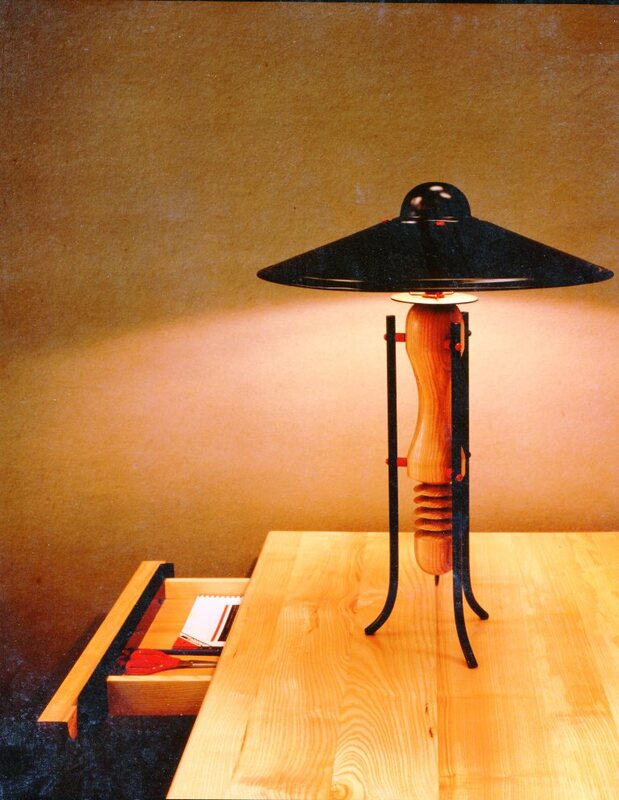 Project: Production drawing Standard lamp. Turned ash, spun steel shade, coated bent steel tube. Home Office collection Mark Lewis as an associate to Johnny Grey Design 1980-83.